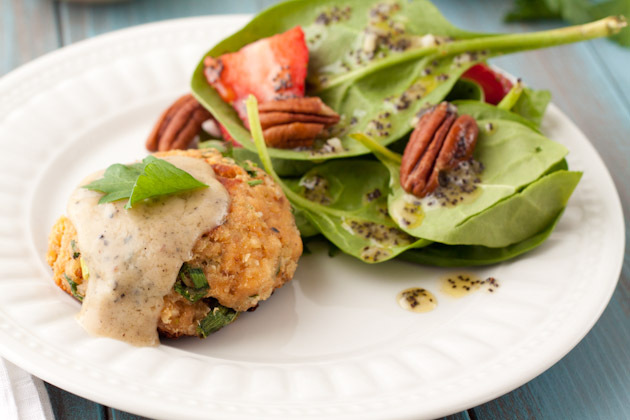 Quick, easy, and gluten-free salmon cakes with freshly cracked pepper and maple served with a creamy (dairy-free) maple sauce. Combine all ingredients but oil in a medium sized bowl. Heat oil in a medium sized skillet over medium-low heat. 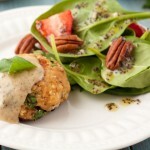 Add the salmon patties and cook for 3-4 minutes per side, or until golden brown. Once complete, place on a kitchen towel-lined plate or cooling rack. If you cannot find quinoa flakes, gluten-free breadcrumbs, millet flakes, or quick oats should work. I have not tried it with this recipe though.